The AMERICAN Field Flex-Ring with black-toothed gripping segments is an integral part of the AMERICAN Flex-Ring joint restraint system. The AMERICAN Field Flex-Ring method of restraining AMERICAN 14" to 36" ductile iron Flex- Ring pipe and fittings is an easy, totally boltless and glandless way of restraining field connections, which also does not require a factory or field weldment. 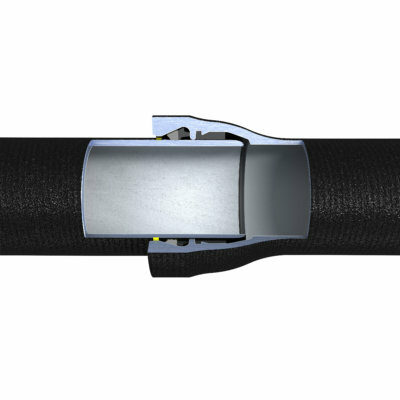 Where field cuts are anticipated, the Field Flex-Ring may be used to restrain joints with any suitable ductile iron plain end or cut pipe in lieu of a standard Flex-Ring joint spigot with a factory welded-on bead. The patented1 AMERICAN Field Flex-Ring is designed to restrain joints in underground service for water, sewage or other approved liquids using Flex-Ring sockets with the same allowable working pressures and deflection capabilities as the standard Flex-Ring joint. Field Flex-Rings may be used with any standard pressure class of ductile iron pipe with an allowable working pressure equal to that of the pipe class, or a maximum of 350 psi in the 14" to 24" sizes and 250 psi in the 30" and 36" sizes. Flex-Ring fittings are manufactured per ANSI/AWWA C110/A21.10 or ANSI/AWWA C153/A21.53. Restrained joints using Field Flex-Ring have been thoroughly factory tested to withstand dead-end thrust resulting from more than twice the rated working pressure. The restraint is provided by the wedging action of heat-treated high-strength ductile iron segments. The segments have a wedge-shaped cross-section with gripping teeth on the inner surface. The ductile iron segments are held in the proper position for assembly by a rubber backing ring. This rubber backing ring is compressed during assembly to ensure that the restraining segments are held firmly in place against the socket wedging surface and spigot. The positioning and compressive force exerted by the backing ring on the restraining segments result in dependable gripping of the spigot when thrust is applied. The rubber backing ring for the Field Flex-Ring does not perform any sealing function for the joint. A separate, standard Fastite gasket is employed in the joint for this purpose. The backing ring is made of gasket-quality SBR rubber that meets all the material requirements of ANSI/AWWA C111/A21.11, Rubber-Gasketed Joints for Ductile-Iron Pressure Pipe and Fittings.